Bust N/A 37.5" 38" 39.5" 41"
Waist N/A 28.5" 30" 33" 33.5"
Length N/A 55.5" 56" 56.5" 57"
Our graceful women’s maxi dress will make a beautiful addition to your autumn wardrobe. It is constructed from a soft, comfortable cotton blend fabric that contains a small percentage of Elastane for added stretch. 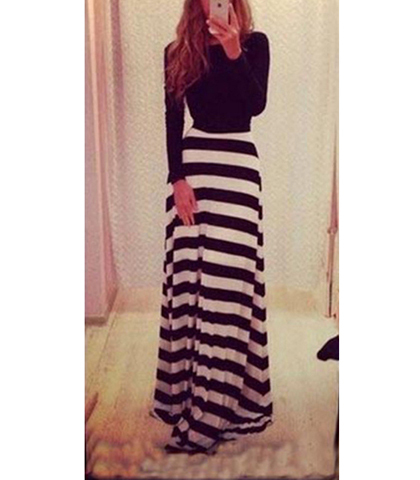 The skirt is presented in bold, black and white stripes. The bodice is in solid black and snugly fitted. There is a large, dramatic, self-tie at the back of the waistline that extends beautifully down the back of the dress. The back of the bodice features a scooped back and a nicely rounded neckline in front. The waist is well defined. This dress is available for purchase in sizes Small, Medium, Large and Extra Large.